Do you still see LinkedIn as a mere job searching site? And you think that it is only a platform to meet professionals? If this is what you are thinking then you need to Wake Up, buddy!! Because the time have changed and quite different now. LinkedIn is a platform which has evolved like no other social network. From just a job searching site it has now turned into a biggest networking site where you can socialize with people around the globe, from every industry. You can take valuable tips from renowned name, promote your brand or promote yourself as a brand. And the best part is that you can even run ads on LinkedIn. So it isn’t just representing yourself as a professional but building a platform for yourself to socialize, to explore and to market your brand. LinkedIn has grown its users to 450 million which is a great number indeed. But wait there’s more! The recent acquisition of LinkedIn by Microsoft has made it even more widespread and advanced. This takeover will have some great consequences which will be visible in the coming years. As far as Marketing is concerned, you might be thinking that LinkedIn Marketing is something revolving around optimizing your LinkedIn Profile and publishing valuable content on Pulse, only! But let me tell you, LinkedIn has come up with some fantastic features where you can run your marketing campaigns with a widest reach now. Because LinkedIn has all the people you need as your contacts, from your colleagues to CEOs, from competitors to Influencers. You have a chance to make your product or service viral in the relevant people in seconds. If you are thinking what exactly do I mean by this, then wait…Because today this post will elaborate on each feature in detail. LinkedIn Pulse is one feature which is pretty popular on LinkedIn and it is considered to be the best platform for content marketing and to show your skills. Pulse gives you a chance to a publisher of your own, have your blog and publish whatever you want and whenever you want without any limitations unlike a usual blog hosting website. I mean the idea of setting up a whole blog and structuring it must scare you at night.. Right? Then Pulse is an end to all your worries! Because this will give you a ready-to-use blog where you just have to insert your content and click ‘Publish’. Now this seems new.. Right? Because till now you only knew about LinkedIn Pulse as a content marketing resource. But recently, Linkedin has developed some new resources and LinkedIn Marketing Solution is a new platform which has got everything you need for marketing purposes. It has its own Marketing Solution Blog which has got some great stuff, specifically related to latest innovative marketing strategies. The platform also give interesting Customers Stories which will give you some great lessons and tips from marketing and advertising case studies on LinkedIn customers. How realistic you want it to be?! I think this would work in great ways when you would have real-life examples of how marketing strategies worked. You will cut the time which is else wasted and finally implement something practical in the market. You will find all the useful marketing resources and solutions at this platform along with some extremely useful marketing techniques you need to promote your product. This enables you to find some best tips and tricks to follow the fast paced advertising world of today. A complete guide on various types of ad campaigns and updates will also be provided here. What else does a Marketer need? Just get your hands on to this resource and get going!! As Shane Vaughan says, “LinkedIn is the place – particularly if you are a small company – where you can go establish yourself as an expert in your space.” LinkedIn now has given a great chance to small business vendors to market their product or service in a unique manner like never before. This resource is giving these people a space to publish their content, convey their opinions and even run their ads. Isn’t it just amazing?! I don’t think small businesses had this kind of space before and that too on such a renowned platform with a huge network and reliable authority. Now LinkedIn offers you a great chance to create easy and super effective ad campaigns without any hassle. You just have to bid your CPC (cost per click) and CPM (cost per impression) and set your regular budget for your ads. LinkedIn will help you to find the untapped audience which you have never targeted before and will give you a much wider reach than you have ever thought. Hence, giving you phenomenal results in terms of high ROI and sales. Coming to the Sponsored Updates, set sponsored updates on your company profile’s page easily and quickly. You can even avail direct sponsored updates which will not be visible on the company’s page but will appear directly on the main feed of people who have followed your page. This is how your ads and updates appear on LInkedIn. 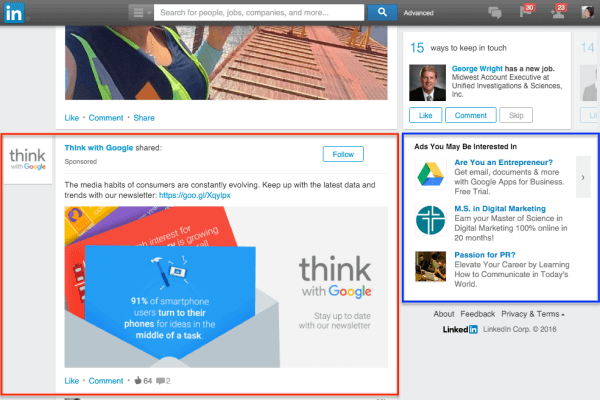 Check this Guide on how to Advertise on LinkedIn. Now this is something which you must be already familiar with. “Upgrading and optimizing your LinkedIn profiles.” This can be your own profile as an entrepreneur or even your company’s profile. In both cases optimization will help you generate traffic and make your name viral. Check out these Tips To Optimize Your LinkedIn Profile by Lisa Dougherty. We all know that LinkedIn is a biggest place to grow your network so why not take the advantage through networking. Marketing becomes easier and much more effective when you have high PR and contacts. LinkedIn allows you to build relevant audience and contacts. These groups and discussions will let you connect with experts and influencers, hence increasing you in exposure and expanding your public relations. So these are the six amazing ways you can market your product or service. These various resources or pages help you build a high audience and do effective marketing. So, just fasten your seat belts…And run along with the changing time and get used to of these innovations at every platform. The new blogs and groups will give you a great chance to meet the people you want, your customers, influencers and the experts of your industry. And trust me these are the people who will build you and your product! Thus, start using LinkedIn to get yourself going and to have an impactful marketing strategy! Guest Author, Hammad Akbar is a tech entrepreneur with a passion for technology and online marketing. He’s currently focusing on a new startup TruConversion , a SaaS application in web/mobile analytics space. Check out his blog HammadAkbar.com.